Cheech and Chong Reunion Tour!!! I Have Been Honored With An Award. If you are under the age of 45, this probably won't mean much to you. Although I only saw them on tv, they were probably the first standup comics I remember. I know, Jack Benny, Bob Hope, Red Skelton and those guys were standups, but I never saw them do more than 5 minutes on their tv programs. I also realize that seeing any of these people in person would have turned my ears blue and made my mother gasp with absolute horror, so exposure to them on tv was for the best. She thought Red Skelton was a total degenerate because of the Gertrude and Heathcliff the seagull jokes--that and the fact that he laughed at his own jokes. But Cheech and Chong back together again. I never thought I'd see the day. And the reason they broke up in the first place was creative differences. I can see that. Cheech came from a well educated family and he was on his way to a prestigious college when he fled to Canada from the draft, which is where he met the Chong family who was into the bars with half naked dancers. Also Chong is quite a bit older than Cheech if memory serves me correctly. I know you are wondering how I know so much about these two. I saw a documentary on Cheech several years ago. In it he talked about his days as a draft dodger, and how he came to be part of the duo, how they made all those crazy movies. And I saw him from time to time on sitcoms. Wasn't he on the spin off from the Golden Girls? Seems like he was a cook at a hotel or something. But then he had the second spot on Don Johnson's show Nash Bridges, which I began watching because of Cheech. And now a reunion tour. The audience will look like those at a Temptations concert. There will be lots of gray hair and grandparents filling the seats. I don't believe I would go to a live concert, but I wouldn't mind seeing them on tv. If you had a chance to see someone who hasn't toured in years, who would it be? I'm just so nosey. You have to tell me. Remember the song we sang as children about 10 little chillins, lyin' in the bed. 1 was sick and the other most dead. Now the kids sing 10 little monkeys jumpin' on the bed, one fell off and bumped his head. Called for the dr, the dr said, no more monkeys jumpin' on the bed. I had 3 children sleeping in my bed last night. Superhero and the two oldest princesses. They all spent the night with me. I slept across the foot of the bed. It was an interesting night. I picked them up from daycare and took them home with me. They love to play together and get along very well. A lot of times two play well together, but when you throw in the third one, it's a different story. But all was well. I had to decide whose turn it was with some things. I don't like being referree. But they had a good time. When we first got home, they wanted to watch a movie. But they had to have some popcorn to eat while they watched. It was dinner time, but you know me, the old softie, I popped some corn and they ate every last bite of it. Then they played inside and out til almost dark. That's when the Big Bad Wolf comes out and Superhero is afraid of him(and dark rooms). They played with leggos and some other things that were mixed in the leggo box. Superhero had left a piece of rope at some point, and they played with that forever. I eventually fed them and got them ready for bed. They all got up this morning with no complaints, ate a healthy breakfast of pop tarts for Superhero and the oldest princess. The other princess had to have scrambled eggies. We all got dressed, and waited for Superhero's mom to come. She had to take him to school becaus I only have two booster seats. They are just so funny--listening to them talk. They can come up with some wild stuff. I think they have very active imaginations. One of the topics last night was going to college and how long you had to wait to go. Superhero thinks you go to first grade then on to college. I had fun with the kids. They range in age from 5 to 4. Princess #1 is 5 and the other two are 4.
Who have you had fun with lately? I must know, unless it's x rated. Then you can keep it to yourself. This is a family friendly site. Last night one of the blurbs to get you to watch the news was a bunch of people reeling in a large shark. As it hung by the tail fin, the comment was 'You caught it, who's going to remove the hook?'. It was funny, and of course you wanted to know who caught it and what they were going to do with it. I think I would have been more interested in who was inside it, or who was going to clean it(not that I'd eat it). Well, somehow, I missed the story on the news later, but I got to thinking about catching a shark and removing the hook. There's actually a pretty good analogy in this story. How many 'sharks' have I caught in my life? And who got the chore of removing the hook. I used to get myself into situations that I didn't know how to get out of. Nothing illegal, mind you, but things I offered to do that later I realized I shouldn't or things I said that I shouldn't have. When I was married to the kid's dad, and I would tell him what I had done, he'd just say, tell them I don't want you to do this or that, which meant he would take care of the hook. Sometimes, I'd get my checkbook in a mess, and be overdrawn, and my grandmother-in-law would remove that hook by giving me enough money to take care of it without a lecture, I might add. Well, both of them are gone. Actually, I divorced the husband, and now both he and the GIL are no longer alive. Fortunately, by the time the divorce came about, I had learned to either not hook that shark in the first place, or to remove my own hook. As I've gotten older, I try to be much more careful about catching sharks. I make sure that when I offer to do something, it is something I really want to do, can do and remember not to let my mouth overload my backside so to speak. I don't have anyone to bail me out when it comes to my checkbook either, so if I only have 40 bucks in that checking account, I best not write a check for 50. We all catch sharks from time to time. And when we do someone has to remove the hooks. Have you caught any sharks lately? You don't have to tell me about them specifically, unless you want to that is, but who removes your hooks? That is of extreme importance. I must know. Have a cool Tuesday. Love one another. I'm working from home, and have been very busy. I think I work harder at home than in my office. I got up early and finished the peaches. I know you are sick of hearing about the peaches, and they are done, so I'll shut up about them. Although, I plan to get up early in the morning and make homemade biscuits and take them and a jar of the preserves to work to share with my co-workers. It's hot outside, and I worry about my son, the Contractor, who is working outside right now. I talked to him for just a moment this morning and told him to be sure to drink plenty of water and rest often. He assured me he would, but I think most of the time, he tells me just what he thinks I want to hear. I'm thankful I'm inside where it's cooler. We're supposed to go over 100 today and possibly the next few days. I'm ready for summer to be over and cooler weather move in. A nice general rain would be very welcome also. I went to church yesterday. Our message had to do with the fact that you can never do enough to earn your salvation. That when you die, you won't have done enough, but that doesn't matter. It's by God's grace we are saved through our faith. What a comforting thing that is to me. I know I don't do nearly as much as I should. Just lazy I guess. I don't do enough good works, I don't pray enough. I don't read and study my Bible enough. But I have the Hope of Heaven just the same. I have started a new diet. That's a famous line of mine. If you read my blog long enough, you will see it often. This is an old diet called the Rice Diet, and that's about all you eat for a while. That and fruit. This is supposed to go on for two weeks and then you begin to add some vegetables. I decided I could probably stick to it better if I added something besides fruit, so for some of my meals(if you could call them that) I add some rotel to my rice. I like it much better that way. And sometimes I add cummin and paprika, so it tastes like what you get in a Mexican restaurant. I think tonight I'm going to add some soy sauce to see if I'm reminded of Chinese. It's supposed to be good for your heart, hypertension and lots of other stuff. I guess we'll see. But just in case it kills me, I'm getting out my best pj's and keeping a pot of coffee going so that when the police come, I'll be ready. Thank you Lisa J for those good suggestions. I'll keep a note lying around too just in case so they'll know there was no foul play involved. I'll let you know if I stick it out and lose any weight. How hot is it where you are today? I certainly hope it's cooler than here. Princess#2 spent the night Thursday night. I was planning to go get peaches and make preserves Friday. I knew it would be difficult to entertain her and stand over a hot stove at the same time. She is a good little helper, but sometimes good little helpers can slow down any process. I call my DIL and asked if Superhero would rather stay with us or go to school. I'm thinking they could entertain each other and let me get my work done. And what a genius I am. They played so well together. I was very impressed. We went to the orchard and got peaches. Here is a picture of the peaches when we got home with them. When we got back, we stopped by the store and got them something for lunch. They both ate and sat in the floor watching videos and playing with some things Princess#2 had broght. I got in the kitchen and started on the peaches. I found that the peaches on top were perfectly ripe, but as I went doen into the box, I found hard unripe peaches. Fortunately, I had enough to make a double batch of preserves, and got them started. Here they are cooking. I put some butter in and the foam magically went away. Here they are after being put in the jars and the water bath. I told you earlier that the kids had been really good. I could hear them talking and playing in the living room while I was cooking. Occassionally, they would come in the kitchen to see if I needed any help, and then go on back to what they were doing. At one point they got sorta quiet and I thought I'd better see what they were up to. In fact they were just watching tv, talking quietly to each other. I loved where they were sitting and they let me take a couple of shots. Seemed like a pretty good place to sit and watch tv. I was very proud of them for being so good. And by 4 in the afternoon, Superhero's other memaw had picked him up, and Princess#2 had been retrieved by her mother. I picked up, straightened up, and sat down to rest. Princess#3 came to spend the night. Her mom got her this morning. So I am alone and happy. What's making you happy this morning? Have a great Saturday. Love one another? I worked from home yesterday, and while I was on my lunch break, I made some chocolate cupcakes. Daughter #2 called and wanted to know if Princess#2 could spend the night. I thought it would be fun for her to frost some cupcakes and have them to eat. These are the large ones. I almost missed getting them in the picture in an attempt to get the cookie jar in it. This is a McCoy cookie jar, and was given to me by my Grandfather the first year after I was married. It's about 40 years old. How much do you think my kids will get for it on Ebay after I'm gone? It's one of my treasured possessions. Don't remember if it ever had a cookie in it. These are the finished product. Just as we were frosting them, Princess#2 informed me she doesn't like chocolate. Oh well, maybe someone will eat them. I used a box cake mix, but made the frosting with chocolate chips, butter, powdered sugar, vanilla and a little bit of milk. We pipped it on, Princess#2 and I. I squeezed the bag and she guided it. Today, we are off to buy peaches. I've been wanting to make peach preserves ever since I saw the apricot preserves Suzanne over at Chickens in the Road made. But I had to wait until they got ripe here in our area. And they are now ready and have been in harvest mode for about a week. This, however is my first chance to go get some. Hopefully, I'll have pictures of that tomorrow. Hopefully, they will turn out. It's been a while since I've made any jelly or jam or preserves. Maybe I haven't lost my touch. What are you doing that you haven't done in a while? Seems like the fuel crunch is making all of us go back to doing some things we didn't think we'd do again. I sure hope I don't have to go back to picking cotton. That would really be a bummer. Hope you have a fabulous Friday. Love one another. I live alone. I love living alone. I love for people to come visit or even stay for a few weeks. But basically I love living by myself. I love the freedom to do what I want to do when I want to do it, and I love not having to do anything I don't want to. However, along with living alone there are some things that you must take into consideration. It's very important to make sure all the doors are locked when you go to bed at night. Even though I sometime forget, I try to make sure I am safely locked in at night. This sometimes causes me to worry what if I got sick in the night and no one could get in. Well, I've covered that with having a key hidden outside. Well, so it's not hidden very well. If you won't tell anyone where it is, I'll tell you since you might need to let in the paramedics to take me to the hospital. Ok, since you've promised not to tell anyone, the key is on the top shelf on the carport. Actually, if you are standing on the top step of the kitchen door, you can see it. I told you it wasn't hidden very well. Any way, one other thing that crosses my mind is what if I were to die in my bedroom in the back of the house. How hard would it be to get me out of there. My house isn't large, and by the time you got the number of people it would take to get me onto the gurney, and then try to get it out of the room, well the vision in my head isn't pretty. You are wondering why I bring up this morbid subject. Well night before last, I woke up about midnight with the honest opinion that I was dying. I have GURD, and the symptoms of it are almost identical to those of a heart attack, which, thankfully, I've never had. But, having not eaten anything I could readily identify as being something that would have caused a flare up of GURD(doesn't that sound like a disease everyone wants to have? ), I, being a person who diagnoses myself, decided I was having a heart attack and was therefore dying. Not wanting to be carried out of my bedroom with the scenario above, I decided the best place for me was to go to the living room and get into the recliner. That's a straight shot out the front door. I also unlocked and opened the front door so it wouldn't be a problem to get in. I didn't want the door damaged. It's pretty new, and the kids will need to get as much for the house as possible. Don't you think I'm a considerate mother? I had taken a prilosec before I went to bed with my other medicine, but I took another when I moved to the living room. I guess it did the trick, because I woke up about 3, felt better, realized I wasn't dead, locked the door and went back to bed. I can tell you are thinking, what a dummy I am. If you live by yourself, you've experienced the same thing. You may not have gone to the extent I did, but you never know when you might need to do the same thing. So, I'm sure my kids will be thinking it's getting closer to time for their mother to go to the home, but I want to know what you have done lately that would constitute you being as nutty as I? Hope you are having a great Thursday. Love one another. I got this in an email. Thought it worth passing on since I feel about 120 today. You BECOME 21, you TURN 30, then you're PUSHING 40.. Whoa! Put on the brakes, it's all slipping away. Before you know it, you REACH 50 and your dreams are gone. But wait!!! You MAKE it to 60 You didn't think you would! 9. Don't take guilt trips. Take a trip to the shops, even to the next county; to a foreign country but NOT to where the guilt is. Hope everyone has a wonderful Wednesday. Love one another. With summer bearing down on us(and it's hotter than the hubs), many of us are wearing sandals or going barefoot in an attempt to stay cool. I have a little problem with swelling ankles and feet sometimes when it's hot, and even sometimes when it's not. But I got to thinking about the number of pairs of shoes I have in my closet. Some I can't wear when my feet are swollen, some I will never wear again because, well, I don't know because, I just won't ever wear them. I have shoes that have gone out of 'style', but I hang onto them. They may come back in style, or I might get an outfit they would be perfect with, but probably not. There are those I bought on a whim, that I didn't like when I got them home, and there are those I've been wearing for over 5 years. Yes, I have a pair of sandals that I have had for over five years and I'm still wearing them. That is when I can get them on my feet. Have you counted your shoes lately? How many pairs do you own? Total. Winter and Summer shoes(no contest here, just wondering)? How many pairs of sandals do you have? How many of 'tie' shoes? Do you wear patton leather? How about white? How many pair of walking shoes do you have? Unless you've recently cleaned out your closet and been really hard on yourself, I'd bet you have in excess of 50 pairs. I have one of those big totes that sits in the bottom of my closet, and it overflows. I haven't actually counted the pairs, but I'd say if not, I've got close to 50. Many are more than 5 years old. I have at least four pair of heels that I haven't worn in 5 years. I don't even wear heels anymore. The flatter, the better. Sandals, well, we're talking close to 10 pairs of those. I wish I had the money I've paid for many of the shoes in the bottom of my closet. But there are a few things that are not in there. There are no white ones. I don't put white shoes on my feet. I think they make my already big feet look huge. I also don't own any patton leather. I don't think I paid over $30 a pair for more than two or three of them. I have one pair that I bought about 15 years ago that I paid $70 for. I remember that specifically because I wore them to my college graduation, and I also remember that I didn't have $70 to spend on a single pair of shoes. So, do you have a shoe fettish, or you just an unknowing collector? Do you buy new shoes often, or just when you absolutely have to. Are you familiar with the name 'Manolo Blahnik'? Have you ever paid over $200 for a single pair of shoes for yourself? Tell me about it. You know it's troubling you and you need to get your shoe stories off your chest. No one here will judge you, laugh maybe, but not judge. I certainly hope you are able to stay cool today, and if you live in South Texas, it's time to start getting ready for Hurricane Dolly. I have an extra bed, if you need to evacuate. It's Monday morning again and will soon be time to get up. I'll be working 4 ten hour days this week in an attempt to conserve gas. It takes me about 25 minutes to get to work, which means over a tank of gas a week, just to get to work and back. I've pretty much ruled out making any unnecessary trips anywhere. I go to church on Sunday morning, but that's not an unnecessary trip. I don't attend on Sunday night because of the gas, and I'm in town on Wednesday already so I go ahead and go then. I made a blanket Saturday for a baby shower Sunday. We have a new baby at church that was born at 3'2 ounces and way less than full term. He's in the NIC unit in Little Rock and will be for a couple of more weeks. But he is pretty much out of the woods and is gaining weight every day. The baby shower was already scheduled, since he wasn't supposed to be here for a few more weeks, so they went ahead and had it. Here's a pic of the blanket. I made it out of two pieces of cotton, so it wouldn't be as hot as flannel, and appliqued the train on it with his name. Then I put piping around the edge and sewed it together. I thought it turned out pretty well. Except for some red eyes, I got some pretty cute pictures of the grandkids. For some reason, most of those I took had at least one child with it's tongue sticking out. The girls spent the night Friday night, and we called Saturday morning and asked if Superhero could come over. He did and the kids had a great time playing. Now that's not to say they didn't make a mess, which they pretty much cleaned up, but they were really good. It's hard to get Princess#2 to smile, but she was haming it up for the camera this time. And as always, Princess#1 was posing. She's pretty good at jumping into the 'pose mode' anytime you want her too. They played and watched movies while I worked on the blanket, and even though in this picture, they are behind my couch, they were being good,which is something when they are all three together. I like the way Suprehero's head seems to be floating in this picture. I could tell you I planned it that way, but you know me better than that. It just happened. Then it was Superhero's turn to go into 'pose mode'. He likes getting his picture made as well as Princess #1. I'll leave you with this beautiful smile. He can melt my heart with this one. When it's just the two of us, he climbs into my lap and want to 'just talk'. He likes to tell you stories, and he loves for you to tell him stories. It helps me remember his dad as a little boy, because that's what he wants to hear. Has anyone asked for a story from your past lately? It could be about you as a child or one of your children, or maybe even of your parents. I've read so many stories that are posted on the blogs that I just love. It seems to be a place for us all to open up in one way or another. I know Marge has heard plenty of stories about her precious mother this weekend as she laid her to rest. Our prayers are with her at this time. Have a great Monday. Love to all. Notice I didn't say Home Made. They were a store bought roll of sugar cookies. Here's what we did to make them special. The first ingredient was two little giggling girls, each with a bowl of cinnamon sugar. I cut the cookie dough into 1/2 inch thick pieces, the laid them flat and quartered them. I gave each girl some and they rolled them in their freshly washed hands and dropped them into the bowl of sugar. When there were several little balls coated with the sugar mixture, they put them on a cookie sheet. We started out pressing them down a bit with a spoon, but soon decided that didn't work too well. They were a bit lopsided. We soon had the first sheet ready for the oven. We ended up using a glass to press them, and they became more uniform. The thing Princess#1 liked about this was licking the sugar mixture off her hands. She had to stop and go wash again. We had a little trouble with the concept of spacing them out so they wouldn't touch. Then we have a pan of the finished product. They had a good time making the cookies, which by the way, Princess#2 won't eat. Not any kind of cookie touches her lips. I'm not sure she is really my grandchild since eating cookies is one of my absolute favorite things to do. Princess #2 peering into the oven to see if the last batch is ready to come out. Notice she is standing back and not touching the oven. We are a very safe bunch. Then, of course, they had to be put on a wire rack to cool. They were already cool by this time, but that's the next step, so we had to follow through. No short cuts on this job, except the store bought cookie dough. We decided not to show any pictures of us eating the cookies. Mainly because we had both hands full of cookies and milk, and Princess#2 isn't a great photographer like her mom yet. So you will just have to imagine that part. They were good, and we are having(I am having) some for breakfast. Princess#2 has requested her favorite breakfast food--scrambles eggs, which she calls eggies, and Princess #1 is having cocoa puffs. So my afternoon and evening went like this. Off work at 5:00, made the 5 minute trip to daycare. Went to building 4 and picked up Princess #1, over to building 3 and picked up Princess #2. Drove to Burger King and ate a nourshing dinner, well I ate mine, they mostly played. We then went to the grocery store, then the 25 minute drive home. Once here, we worked on the cookies, which didn't take that long, but boy was I one tired little old grandmother--just joking about the little part, mainly old. After the cookie baking, the girls got in the tub, and I sat down to watch the Cardinals. They got out of the tub and P#2 managed to stay up til 9:00 and P#1 made it til about 9:30. After the game was over, I took a shower and slept on the foot of the bed until about 3:30. The girls had pretty much settled over on one side of the bed, and I moved up to the other. They have just gotten up, and are already ordering me around. Do they think this little old grandmother is their slave. Well, I guess, she really is. Once I think Superhero is up, I'm going ot call over there and see if he wants to come play for a while. How many children will be under your feet today? Hopefully, there will be at least three, and maybe four. I can't wait. Gotta go cook some eggies. Have yourself a great Saturday. Do something silly. Make someone laugh. Just a quick picture of The Tiny Princess. She belongs to my son, aka The Contractor and my DIL She's learning to pose. I think Friday is my favorite day of the week. And it's very easy to understand why. Because I get to stay home the next two. I've got a busy weekend planned. Daughter #2's girls are coming to spend the night tonight. Some of D#2's friends are giving her a housewarming tomorrow afternoon, and I figured it would be a good idea if the girls weren't underfoot tonight so she can get things straightened up. I'll get them ready tomorrow and take them in time for the party. But this will give me some memaw time with them. I don't usually have both of them at the same time. So this will be special. I think we are going to bake cookies tonight. Not from scratch, but the slice and bake kind. But it will be fun. Maybe I'll get some good pictures. We are having a baby boy shower for a girl at church Sunday. I'm making a double sided cotton blanket. It will have white on one side and blue micro-mini check on the other. I'm planning to applique either a little truck or a tractor on it, and I'll put piping around the edge. I hope it turns out pretty. The baby is a preemie and is still in the nic unit at Children's in Little Rock. But he is doing really well, so I thought since its so hot, a light blanket would be good. 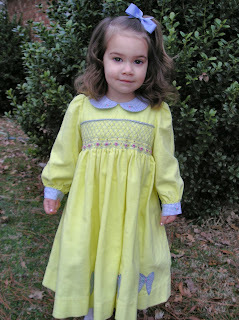 I also have a couple of daygowns to get smocked and finished, also for gifts. I cut them out Wednesday, sewed the sleeves in and pleated them last night. Do I hear a 'busy girl' from any one? I also have an inset for a boys outfit to smock and then make the outfit. Back to Friday being my favorite day. I really have seven favorite days. Silly huh? I'm thankful for every day the Lord allows me to be here on this earth with my family and loved ones. I say a little prayer every morning letting Him know that, and I also tell him I'm going to go about doing all the good I can today. I try to get my mindset ready for whatever comes along. It helps me think twice before I get angry with the fellow who cuts me off on the way to work, and it especially helps me to keep my comments to myself. You know how this tongue can get us in trouble, and mine is certainly able to get me in deep. I often think of the scripture that lists gossiping with the worst sins in the Bible. Someone remind me where it is. Naturally I can't find it. It list the worst sins and says all these will have a place in the lake of fire. I most certainly don't want my tongue to cause me to lose my soul. I still haven't decided the name of my gnome, but I'm leaning toward Ole. The reason for this is that John Wayne in his B movie days made a movie where he was a young Swede on a cargo ship prior to WWI, and was planning to go home. In fact the name of it may have been The Long Way Home. Anyway, he ended up being shanghi'd and then his ship was sunk. He had a terrible Swedish accent and it was funny listening to him. In this movie, his name was Ole. You know what sucker I am for John Wayne. Which day of the week is your favorite? We all have them. Tell me which one and why. It might help me to pick one particular favorite. Have a fabulous Friday. Do something silly. Make someone laugh. 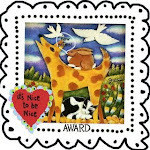 I received an award from Robbin over at Cedar Chest of Dreams and I feel very special. If you aren't reading her blog, you should be. She is an amazing woman who is going through a lot right now. But she continues to be strong and is making the best of a couple of bad situations. I have become acquainted with her though this media, and consider her one of my friends. I never know who is reading what I write unless a comment is left. I have a few friends and co-workers who read me. I know this because they tell me they read my musings, whinings, complaints and silly stories. So it is nice to get an award like this from one of my peers. One of these days, I'd like to have an opportunity to meet some of the amazing women I've met here but getting everyone together would be a major task with gas prices what they are. But maybe we'll get to some day. I hope you are having a special day. I have another day of training. Training is good, but you get behind on so much of your other work. But this will be a good thing for our campus. I have a question for you today. Do you blog in your skimpies? I know you do. It's just so easy to get out of the shower, put on your undies and sit down and blog while your hair drys. I'm so thankful you can't see me. You'd be scarred for life. Have a wonderful Thursday. Do something silly. Make someone laugh. Aren't you excited for me? My friends were last night when I announced to them at dinner that I had a new man. Even though they were all smiles and excited, I knew down deep they were wondering if I needed to be institutionalized. I met the girls after work to celebrate the birthday of one of them. We sat down, and I handed my friend her gift. But before she opened it, I told them I had some news. Good news or bad news was the question. I assured them it was good. I told them I had a new man in my life. Ohhhhh! was the reaction. I told them I wanted to introduce them to him and he would be joining us for dinner. OK, they said. Why I didn't have my camera to get the expressions on their faces, I just don't know. Now if you know much about me, and I don't usually delve into my very most personal life here, you would know that I have been married twice, and believe me when I say once was more than enough(No 'Black Heels to Tractor Wheels' here). At this point, I have four very important men in my life--my son, and three grandsons. So knowing me as these gals do, they obviously thought I had lost my mind. When I felt they had been sufficiently surprised, I reached into my bag and brought out this lovely gentleman. Here he is hiding behind the orchid in the Living Room. He's a bit shy. Here he is in my bed. Isn't he just the cutest ever? Once I set him in the middle of the table, and they realized this was a joke, they all breathed a collective sigh of relief. Yes, they still had their doubts about my sanity. The very idea of a 59 year old woman running around with a gnome in her bag!! They also expressed that I had almost given them a heart attack. Can't you see paramedics responding to a collective heart attack--with a gnome sitting on the table? And, as usual, we all had a good laugh. After all, laughter is the best medicine. We ordered our food, ate until we were miserable, visited for a while and came home. We always have such fun when we're together. But the problem with my gnome, aside from the fact he's carrying a mushroom(think he's a hold over from the 60's?) He doesn't have a name. If you have a snappy idea for one, just leave me a comment and let me know what you think I should call him. If I choose the name you suggest, there might just be a little(and I said little) something for you. Have you played a joke on anyone lately? Did you almost kill anyone in the process? Tell me your funny stories. Have a wonderful Wednesdy. Do something silly. Make someone laugh. 'It' being my mind. Saturday when I was cleaning up the kitchen, I put a platter and dish towel my DIL brought over the 4th of July in the recliner in the living room. Strange place, you say, but if I didn't put it somewhere that I'd remember it when they came over, it would stay at my house for for for ever. So, there it was when I left for church. In the afternoon, I was getting ready to vacumm the spare bedroom and there was a diaper bag that had been left at the house at some point. So I'm thinking to myself that I'd put it in the living room with the platter and dishcloth. When I walked in the lr to put it with the other things, the chair was empty. I had the funniest feeling, because I knew those things had been there when I left for church. I looked around for a few minutes and decided I was losing 'it'. Later in the day when the Contractor came by to cut my grass, I asked him if he'd been there earlier. He said he had come by and gotten the bbq grill. I asked if he came in and got the platter and he assured me he hadn't. So yesterday morning when I got to work, I instant message'd my DIL and asked her. She had come over to get some clothes she had left and picked it up on her way out. WHEW! that was a close one. I often think I'm losing 'it', but then you have some really close calls and you really get worried. Have you lost anything lately? Did it make you think you were 'losing it'? Tell me so I'll feel better about myself. After all, a mind is a terrible thing to lose. It's about noon on Monday. I always hate coming back to work on Monday, but you do what you have to do. I had a lazy weekend. Other than going to church yesterday morning, I didn't leave the cacoon I call my house. As much as I love people, I think I could stay in my house forever. That is if someone would bring me food occasionally. I've been watching the Cardinals play ball this summer. It's either that or reruns of EVERYTHING that's fit to watch or reality shows. You know, reality bites, and I hate those shows. And you can only watch so much of funniest videos. So, I've gotten into watching ballgames. When I was expecting my youngest daughter(she's now 28), we had just gotten cable and TBS. And the Braves always played afternoon games. I rocked her and watched the Braves. But now it's time for the Allstar break, so I'm not sure how many days I'll be without baseball. Maybe I need to rethink those reality shows. Or Matlock, those reruns are old enough that I've forgotten them from the first time around. I've also re-watched all the Beverly Hillbillies. I'm just ready for the new season to start, we got so few new shows last season with the strike and all. But, I'm ready to see what Denny Crane of Crane, Poole and Schmitd has in store for us. And what's going to happen on Brother's and Sisters. I'm a little tired of McDreamy and Meridith. She seriously needs help!!! And it will be interesting to see how many Crime Scene shows we'll have. I've quit watching them, they are a bit too gory for me. I don't really need to follow a bullet into a body to see what the damage it does. And special victims units. I like my sheltered world and don't want to know what sick people are doing. I found the guy that used to play Dan Fielding on Night Court. I think the name of the new shows are called McBride. He is a lawyer, and they are pretty good. Maybe they'll bring him to primetime. I've complained enough. Maybe I should just turn off the tv and clean, or sew, or read, or study my Bible. But I'm a tvaholic. I turn it on before I kick off my shoes in the afternoon. I set the sleep timer so it won't stay on all night. I turn it on before I get up in the morning. See, I'm totally addicted. Is ther a 12 step program for that. Wonder what channel it's on? What nonsense are you addicted to? Maybe my addiction won't seem so bad if I know what yours is. For some reason I think of the name of the Kris Kristofferson's song on Sunday morning. I know he was probably coming down off a drunk, but for some reason the name always comes to mind. For me, Sunday morning is a time to replenish my soul. I go to worship, where I get to see many people that I don't normally see during the week. They are an encouragement to me. There are usually about 25 ladies in the class I go to, and then about 500 in worship. Growing up, I just didn't know there were that many Christians in the world. I live in a small town, and when I was a kid, there was about 60 in our congregation. Most of them women. Where I go now, there are as many men as women. I love seeing families together in worship. My dad never went with us, and I married a man who went with me while we were dating, but quit soon after we married. So not only did my mother raise her children in church by herself, I did as well. I don't pretend to be the strong dedicated person I should be, but I can't imagine my life without my church family. I have family. Not a lot nearby, but I have a few cousins, and my children and their families. I have friends, and I think, quite a few of those that I love dearly. But I feel so close to my church family. So, I'm off to worship this morning. I'll get a warm hug from Mr. Randy, talk to whoever is being a greeter this morning, and as I make my way to class, I'll get to visit with others I know there. Are you going to worship this morning? Tell me your favorite thing about your worship service. Have a wonderful Sunday. Do something silly. Make someone laugh. I decided I wasn't going to pay $17 for a half bushel of peaches. I'll wait until my step-mother and her husband go to the orchard and ask them nicely to pick me us a half for a still unreasonable price of $10. I like $10 much better than $17. In the meantime, my friend Tonya and her husband are going blackberry picking tomorrow. They have found a sweet spot and have already picked some. I was telling her about the peach situation, and she said she'd pick me some blackberries if I'd share the jam. I thought that would be a good trade. So next week, hopefully, we'll have a few jars of blackberry sweetness in a jar. I love blackberry cobbler, but I like peach and apricot preserves better. But, you take what you can get. I've made blackberry and it turned out very good the last time. But remember, that was several years ago. Maybe I haven't lost my touch. So today, I'm going to get my kitchen very clean, and get out the utensils with which to make it. Bring in the jars I bought that are still in the back of my vehicle. Get everything washed and ready to go. So I guess I'm going to spend my day cleaning, but tonight is when the fun happens. I called my DIL a little while ago and told her to plan something for her and the contractor tonight, cause this babysitter is ready to play with the grandchildren. What are your plans for today? Yours might be more fun than mine and I might want to do what you are doing. Have a great Saturday. Do something silly. Make someone laugh. I decided that I would like to make some peach preserves. I don't have a recipe, so if you have a good one, send it along in your comment. I haven't made preserves or jelly of any kind in approximately 15 years, maybe longer. My son's MIL has a tree, and my DIL said we'd go down and pick them since her mother was gone on vacation and they'd probably go to waste. We went, but there was not a peach on the tree. We don't know if she picked all of them prior to leaving, or if someone else helped themselves. We thought it strange that every peach was gone. There weren't even any lying on the ground. No free peaches. I began to think I had missed the crop. Usually there'll be someone sitting on the side of the road selling watermelons, cantelopes, tomatoes and usually peaches when they are ready. I stopped at the Farmer's market on the campus where I work, and was told there would be peaches on Saturday. They didn't know how much they would cost, but they had two different places bringing them in. There's also a small place on my way to work that has fresh fruits and vegetables. It was open this morning when I was coming in to work so I stopped to see if he had or would have any. Yes, this afternoon after about 4, he would have peaches. How much I asked. He gave me a price per lb. I want a half bushel. He quoted me a price of $17 for a half bushel. These preserves may get too expensive for me. A dozen jelly jars with lids and rings was 6, the sugar and sur-gel was 2, and now the peaches are 17. That will make my peach preserves cost about $25. I'm not sure how many jars or half pints I will be able to get from a half bushel, but something tells me I could have bought a lot of jelly for $25, and a lot less work. Anybody know where I can get some free peaches? I don't mean to sound cheap, but money's tight right now. Hope you have a great Friday. Do something silly. Make someone laugh. And I haven't even worn it yet. My effort thus far is pictured here. The hole is in the extreme right center. It sorta looks like there's one on the opposite side, but I think that's just where the stitches are stretched. I decided, after reading some of Debbie Macomber's books that I wanted to learn to knit socks. I have knitted sweaters, scarves and dish cloths but I'd never thought I could tackle socks. And I thought if I could get good at it, I could make some for gifts. Daughter #2's youngest daughter loves socks. She won't go to bed at night without socks on even in the summer. So, I bought a set of 4 needles, a pattern, and came home to get started. I was finishing another project(aren't you proud of me) so I didn't start immediately. But I got started the other night. Using four needles is clumsy. I have large hands and I think that probably made it worse, but I started. These socks are made in a continuous circle(a very small circle-it's a sock, remember, can't be very big) and the first obstacle was to connect the first row in order to start the next. I finally got it connected, and went on. I have about 15 rows on my sock, but I noticed last night that I also have a hole. I'm assuming I dropped a stitch, but I'm not going back. After all this is a learning project. I'm using some thread I had, so I'm not ruining some expensive sock thread. And just in case you doubt that I actually finished the other project. Here is is. I haven't starched and blocked it yet, but I think it's pretty cool. It was hard to do because it doesn't follow the typical crochet pattern going around and around. This went back and forth, and I was constantly tying off and re-attaching. But I think it turned out really well. My mother would be really proud of my effort. She crocheted a lot, and I have several of her doilies. What project have you finished that you are really proud of? I have to know. I failed to post yesterday. I don't know why, but I didn't. I liked the list of unfinished projects you admitted to. Most were the same type as mine. I've been sewing and doing handwork most of my life. My mother taught me to sew, crochet and embroider. I taught myself to knit and smock. I don't know if any of my projects go that far back, but I have several that are 20 + years old. I did finish the butterfly for my granddaughter last night. I still have to starch, iron and block it. It's much bigger that I thought it would be. But I think it will be really pretty framed and on her wall. Some of you mentioned that you have boxes to unpack and sort through. When my DIL and grandchildren stayed with me for a few weeks, we had to make room for them. The most important place we had to make was a place in my sewing room for a crib. The crib will stay for a while even though they are in their own place. As a result, I have several boxes still sitting in my bedroom floor and not much room to maneuver around. I need to take a week off from work, completely empty my sewing room, re-position everything and start over. 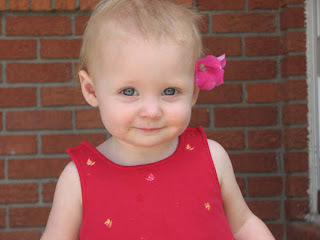 Last year I sent a couple of pictures of my granddaughters to the Austrailian Smocking and Embroidery magazine. They were wearing dresses I had made for them from the wonderful patterns. They sent me a gracious thank you letter letting me know they had received them, and would possibly use them in a later issue of the magazine. I picked up issue 82 of the magazine at The Fabric Store, and sure enough there was Riley and Maddie on page 2. So now they will be seen around the world. I thought, I had used the pictures on my blog, but since I can't find them here, I'm inserting them now. That's Riley in the green dress, and Maddie in the yellow. Don't you agree they look like they are ready for the runway? Do you have unfinished projects lying around the house staring you in the face daring you to finish them? They seem to be everywhere in my house. They mainly include sewing projects that I buy the fabric, patterns and then the kids outgrow the pattern or the design before I get it made. I unfinish other things as well. The kids bring things to me to do for them and somehow I never get to them. Daughter#2 brought me several pieces of fabric several years ago. I made all but one piece up. Why I didn't go ahead and do the last one, I don't know, but it's there in a bag waiting patiently. I have a quilt that I was going to quilt by hand. Did I? Started it, but never finished it. I need to take it to the quilt lady and let her do it on her machine. But then I'd have to check that one off my list. But once in a while, I do finish something. I bought a kit to crochet a butterfly before my now one year old granddaughter was born. I wanted to make it and frame it for her wall. I remember hitting a spot that I couldn't seem to figure out, and as a result I pitched it aside. I had the body done and part of one wing when I gave up on it. A week or so ago, I ran across it and thought it would be nice to have it finished by the time they get ready to move into the new house. I have just about finished it. I've got to find a needle with a huge eye to do the sewing on it and then I'll post some pictures. It turned our really pretty, if I do say so myself. It's ecru and I think will be very pretty in her room. I was going to have it matted on lavendar since that is the color her room was, but now I'm glad I didn't finish it. The contractor(aka the little princesses daddy)says her room can't be lavendar this time. I've decided to have it pressed between two pieces of clear glass and then put a frame around it. That way it won't be glued to a matboard, and it will match any color she has her room. When I get if finished, before I have it matted, I'll take some pitures. It is really pretty. My next project is knitting socks. I started working on one last night. I've never done anything like this before, so I'll probably never have two that are the same size. And then again, this project may fall into the unfinished bin with all those others. Tell me about your unfinished projects. You know how nosey I am. I hope everyone had a great day yesterday. I'm thankful that I have lots of leftovers. I won't have to cook for a few days. I'm very tired. I love my family, they were all here. We cooked, we ate, they shot fireworks. I love making memories with my children and grandchildren. I'm going back to bed. Wake me Sunday morning in time to go to church. Happy 4th of July to everyone who might cross the path of this blog. I know we should reflect on this day about the founding of this great country. That's a bit hard when we have $4 a gallon gas and see how that has affected every aspect of our lives. Not only from how often we get in our cars, but the price of food, and the cost to heat and cool our homes. It's getting hard to decide whether to drive to work, eat or have medicine. I've already made a mental list of what services I will have to cut in order to keep this roof over my head. But enough complaining, we could be living in Iraq and wearing Berkas and picking sand fleas out of our hair, so I'm going to quit complaining. I'm proud to be an American and thankful to live in this country. My family and I will gather here at my house for an afternoon barbeque. My youngest daughter and her family are going to a parade and festivities in Caraway this morning. They have a big carnival and picinc for two or three days during this time. They always enjoy it, and her grandfather-in-law will drive his little antique hoopty car in the parade. It's always fun for the little ones to see Papaw Clyde in the parade. My oldest daughter has been without her youngest son for the past few weeks. He will be home about lunch time. She has missed him and is excited that he is coming home today. I'm not sure what my son and his family will do, but I think they may also go to the parade and picnic. As for me--I'm going to the grocery store early this morning, I've already cooked the potatoes and eggs for both the potato salad and deviled eggs. I plan to get as much done this morning while it's cool as possible. Then I'm going to kick back and wait for the grill to get fired up. I'm going to make a pineapple pie that is a refrigerator dessert/desert(I can never remember if it's one 's' or two that makes it something yummy or a place that's dry and dusty). The bbq master grilled some burgers the other night that were wonderful. I'm hoping these today will be just as good. Gotta get ready and go to the grocery store. Hope you have a wonderful Friday. Do something silly. Make someone laugh. Last night in our ladies class our subject was Living by Example. The teacher handed each of us a slip of paper. She asked each of us to write our name at the top, fold it in half and give it to her. She then mixed them up a bit and handed them back out to each of us. There were about 20 in our class and not everyone knows each other(which is a shame) and we had a couple of visitors. Our instructions were to list at least three things about that person that makes them an example. The person who got my name happened to be a visitor, and made only comments about what she had seen prior to class. Mine happened to be pretty easy to list since the lady whose name I had often leads prayer, is a very pleasant person, a godly mother and grandmother. We then talked about women of the Bible and the examples they are to us. We have books on the lessons we can learn from them. I can think of several women who were written about--Sarah, Ruth, Martha, the virtuous woman in Proverbs, Esther and of course Mary, mother of Jesus. All this reminded me of an incident that happened when I was in a home economics class in high school. It was somewhere between my 9th and 12th grade years because that's when we were allowed to take that class. It seems we had a teacher who asked each of us to take a piece of paper and write something about one of our classmates. I don't know if we were to write a compliment or a criticism or if that's just what I chose to write. It seems that one particular girl, her name is Donna(who happened to be a beauty queen, extremely smart, and very nice) recieved more than one piece of paper. One was from me. Many years later, in fact just in the last few years , she was talking to another of the girls who had been in that class, she mentioned the pieces of paper with the comments. She said she had recieved more than one comment and most of them weren't nice, but that the one I wrote was the worst. When this incident was related to several of us, no one remembered this happening. We must not have gotten pieces of paper with evil written on their lines. This has bothered me for quite some time. I know I was a stupid young person. I know I did some dumb things. I know we spend much of our adulthood trying to live down the rediculous things we did growing up(and I had a lot), but I honestly have no memory of willfully hurting Donna. Maybe I didn't realize this(also evil) teacher was going to give them to the person about whom they were written. Did she not think that having grown up together we wouldn't recognize each other's handwriting? I'm not trying to take away any responsibility from myself by blaming the teacher, but she had some culpability in this evil deed. And it was evil! I can think of no other way to describe it. We all say and do things that unintentionally hurt other people, but to take pen in hand and put something on paper, couldn't have been anything but mean. I doubt that Donna will ever read any of my posts. I have little contact with her now. Thus apologizing in this forum, may be the coward's way out. But I truly am sorry for any emotional pain I caused her. I hope she has forgiven me the ignorance of my youth. I don't get up each morning thinking I am going to try to be a good example today. In fact my daughters often chastise me for my behavior. I often speak when I should be listening, and leap before I look. But I'm trying to learn to keep my comments and opinions to myself. My mother, who was a wonderful example, used to say if you can't say something nice, don't say anything at all. I don't think she originated that pearl of wisdom, but I would have done well to have taken it to heart much sooner in my life. So I think the moral to this story is to look to someone beside me for your example, and while I'm trying to be better, please remember my feet are made of clay. Maybe it will be better that you recognize and learn from my mistakes. Who do you look to for your example? Tell me about them. Have a great Thursday. Do something silly. Make someone laugh. The other day while reading through some of the blogs I check daily, I ran across one that had an award posted that stated her blog was rated 'College Undergraduate' level. The link was also posted taking you to a place that after typing in your URL, it would scan your blog and tell you where you rated on their scale of 'intelligence'. So, I put in my URL, and it came back 'Elementary' level. At first, I was a little peeved that my blog didn't come back with 'Doctorial' level, being the genius that I am---NOT! But it could have at least had been 'High School' or something better than 'Elementary'. Not to brag, but I do have a BS in Computer Information Technology and have worked in my field for 13 years. So while I was feeling insulted this morning, something dawned on me. I'm very proud to be rated 'Elementary', because in many of the English and Communication courses I took in college, we were taught the KISS principle. I know many of you already know what that means, but if you haven't heard, it means Keep It Simple Stupid! And before you feel insulted as I did earlier, I realized I was doing a great job of putting my thoughts and ideas out in a manner in which everyone who reads my blog would easily understand. Case in point--Would you rather sit and listen to someone who is talking over your head, or someone who can put their thoughts in a language that is easy and pleasant to listen to. That's what I hope to do here. That is make your reading pleasurable. That way, even though I write for myself and family primarily, you may want to read what I have to say rather than after the first few lines, lose track of my thoughts, and click on someone else's blog. I don't post enough pictures, I don't wax philosophical, I can't spell worth a dime any more, I am not a poet or a deep thinker, and there are lots of other things I am not, but I enjoy this medium, and hope anyone who ventures here does too. Gee, I guess I've found another soapbox onto which to climb.